Many cat owners do not realize their friendly, single adult cats may have trouble getting along with a new kitten. A new kitten is typically eager to make friends, but the older cats in the household may want nothing to do with the younger one. Often times the older cats will appear sad, reclusive, hiss a lot, and sometimes even stop eating if they aren’t adjusting well to the new member of the family. These behaviors are because cats do not like change, especially when it involves their established territory. Introducing a kitten to an adult cat can cause a lot of stress in your household, but there are some things you can do to help make the introduction go more smoothly. Preparation is the key to a successful introduction of a new kitten to your older cat. If you prepare your cat for the new arrival and make the changes seem less drastic, then they are more likely to adapt to their new roommate. Give yourself (and your older cat) plenty of time to prepare for this adjustment with these steps. Pheromones are useful for creating a calm environment for any cat. The weeks before the arrival of a new kitten is a great time to make use of them. Diffusers, sprays, and wipes are all available and help your cat feel relaxed without the use of drugs. Try using pheromones for at least a few weeks before bringing home a kitten. If you suspect your older cat will become stressed and anxious with a new kitten, consider nutritional supplements that are designed to calm a cat. These won’t drug your pet but will help them remain calm and relaxed. They typically work best if given a few weeks prior to the anticipated stressful event and can be continued after the new kitten arrives. The ingredients usually include L-theanine, Phellodendron, magnolia, whey or milk proteins, and other natural ingredients shown to be safe and effective for pets. New items for your kitten, such as food bowls, beds, another litter box, and toys, should be placed in and around your home before the kitten comes home. Start putting these items in their new places about a week before the new arrival so your cat can smell them and get used to all the new things. If you can, try to include items that have the scent of the kitten on them already. Make sure you are ready for the kitten. If you are stressed out and unprepared, your older cat will be able to tell and be negatively affected by it. Designate a small room, such as a bathroom, for your new kitten to retreat to and spend the first week or so in. Your older cat should be able to get to the door of this room in order to hear and smell them, but not have any interaction with them. Place the kitten’s belongings in this room (such as litter box and food bowls) along with a toy that belongs to your older cat. Make sure your older cat is healthy. Added stress to an unhealthy cat will only make things worse and you want your cat not only mentally prepared for a new kitten but also physically ready to handle it. Take your cat in for a checkup with your vet to make sure it is healthy and that its vaccinations are current. Respiratory diseases are common in kittens and you’ll want your older cat’s immune system to be ready to tackle anything that comes into the house. If scratching or biting occurs between the cat and kitten, you’ll also want the rabies vaccine up to date to avoid any problems. While older cats will occasionally take to a new kitten right away, they typically need a little time to adjust to the changes. Sometimes cats never fully accept a new kitten but will simply coexist, keeping to themselves away from the other cat in the house. You’ll want to make sure that no matter how your cat feels about the new kitten, that things stay peaceful and you have the best chance at creating a budding friendship from the start. When you bring your kitten home, allow your cat to sniff it while the kitten is in a carrier or your arms. Go directly to the room previously designated and set up for your new kitten and allow the kitten to explore. The litter box, food bowls, bed, and some toys should all be easily accessible. Do not let your older cat have unsupervised access to the kitten. At night, when you are not home, and whenever you are unable to supervise the kitten and your older cat, keep the kitten in its designated room with the door closed. As your cat gets curious, it may stick its paw under the door, sniff under the door, and listen to the kitten. Do this for about a week, depending on how your cat is acting with the changes. Don’t forget to provide a lot of attention to your older cat after playing with your kitten. It’ll need your attention and support and the scent of the kitten on your clothing will help it get used to the newcomer. After about a week, let your kitten explore the house under your watchful eye. Allow your older cat to observe this exploration and retreat if it wants to. Do not force interaction between your cat and kitten. If your cat has a favorite interactive toy, like a feather wand or laser pointer, try playing with both cats at the same time. This will encourage mutual activity. You can also give them both treats at the same time and feed them at the same time from separate bowls. Be sure to leave enough space between the food bowls so your older cat does not feel threatened. 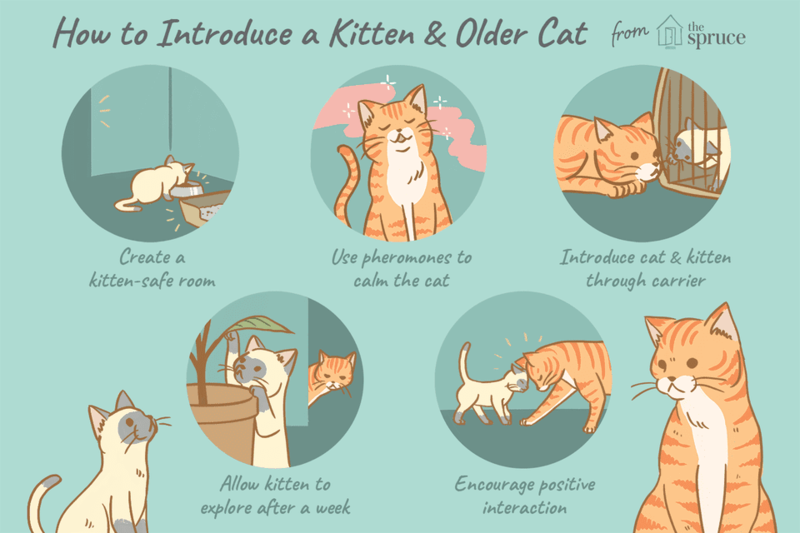 Encourage any positive interactions your older cat has with the kitten using praise, treats, and physical affection. You want your cat to associate the kitten with happy, positive things. Cats need to have order and a new member in the home must know where it ranks. Your older cat may have a period of time when it tries to establish a hierarchy with the new kitten. Your older cat may hiss and swat at the kitten when the newcomer does something unfavorable. This is completely normal and as long as they are just hissing and swatting, do your best to not interfere. Your older cat is establishing its role as the dominant cat in the household and the kitten is being taught where its boundaries as the new cat are. Don't give up if the first encounters are not positive. Older cats can take time to acclimate to a younger cat. A common mistake is to rush the socialization between cats and then getting mad or frustrated when it doesn't work out. Keep calm and work in increments to bring the cats together. Try timing your interactions and slowly increasing the amount of time together. If your older cat is especially aggressive toward the new kitten, speak with your vet or a behavior specialist for tips.